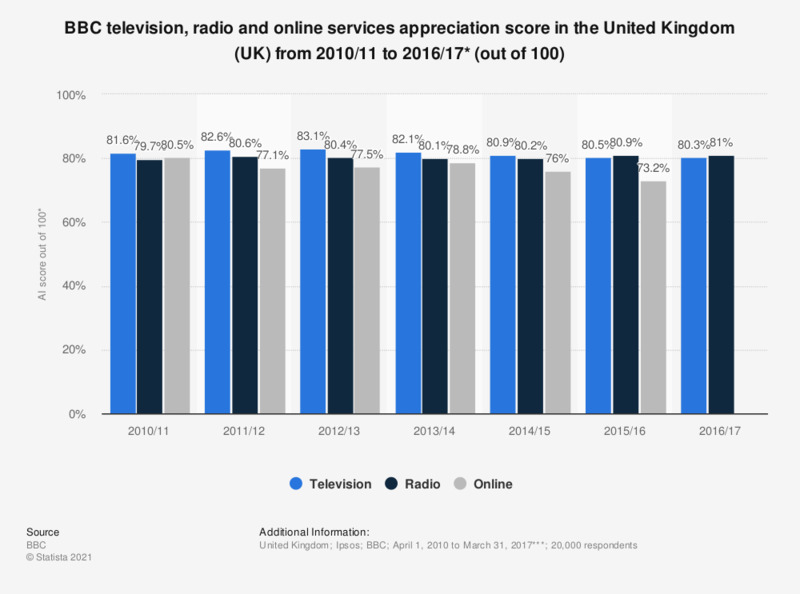 This statistic displays audience appreciation of BBC services in the United Kingdom (UK) from fiscal year 2010/11 to fiscal year 2016/17. In the year ending March 31, 2013, BBC television had the highest appreciation score at 83.1 out of 100. * The BBC services are rated using the audience Appreciation Index (AI) and given a score out of 100 by an independently run panel of 20,000 people. The source did not provide further information regarding study methodology. ** Data for years prior to 2017 were published in earlier annual reports. *** The BBC's fiscal year ends annualy on March 31st. How important is NRK (Norwegian Broadcasting Corporation) for you and for society according to your opinion? How important is NRK (Norwegian Broadcasting Corporation) for society according to you? How important is NRK for you?